Pennsylvania Jack has several hobbies. One of them is serving as a Volunteer Lighthouse Keeper. So let's call him "Lighthouse Jack." 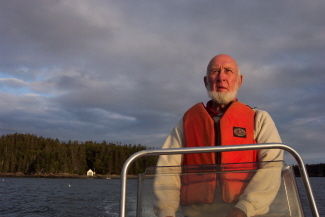 Each summer, Jack and his wife travel somewhere in the good old U.S.A. and volunteer their time and knowlegde as "keepers/tourguides/docents" at a Lighthouse somewhere. So far they have been at two lighthouses in Maine, one in Oregon, four in southern Michigan, one "In" Lake Michigan, two on Lake Superior on the "UP" (Upper Peninsula - it really is different "up there"), and another on the north shore of Lake Superior in Minnesota. Information and photos of all of these are found below. When we first volunteered back in 2005, we really knew very little about lighthouses, and in fact didn't even know we liked them all that much. Many summers later it has become a journey that we just can't imagine never having embarked upon. Along the way we have learned much about lighthouses, their operation, history, and lore, and would like to share it with you. 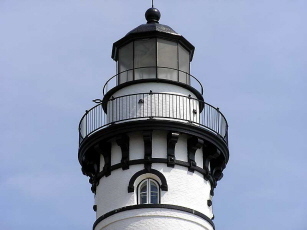 So this page will include some lighthouse information and lore, as well as photos of all of the places we've been, and links to some very interesting websites about lighthouses too. Then you too can claim to be a "Pharologist", one who studies lighthouses. Interested in lighthouses and their history? Consider subscribing to the "Lighthouse Digest," a bi-monthly magazine chock-full of informative articles and historic photos. Visit the "Lighthouse Digest" website. 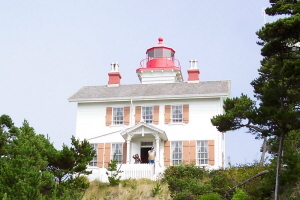 To find out about almost any lighthouse in the U.S. or Canada, use the "Lighthouse Friends" website. 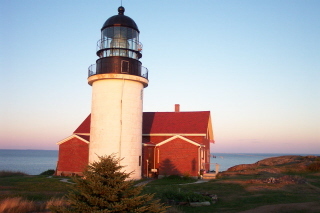 Visit an excellent site about New England Lighthouses - "A Virtual Guide"
For almost everything else you'll ever want to know about lighthouses, visit the website of the U.S. Lighthouse Society, the foremost lighthouse education and preservation organization. 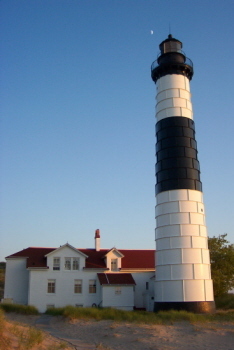 "U.S. Lighthouse Society"
MICHIGAN The photo above is a sunset shot of the LITTLE SABLE POINT Lighthouse on the east shore of Lake Michigan, one of the lighthouses where we have been volunteers. More on this one, and all the others where we have served follows. Lighthouses, in addition to usually being architecturally pleasing structures located in scenic locations, provided much needed beacons of light to guide mariners along treacherous shores. The first lighthouse in the United States was built in Boston harbor in 1716, and over the next two centuries, hundreds more were built along the coasts and rivers of our nation. Today, far too many are gone. Those that remain display either no light at all, or an automated one, but these historic structures have captured the imagination of historically minded Americans. 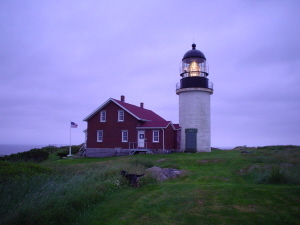 Although a few remain under the juristiction of the U.S. Coast Guard, the agency that took over American lighthouse administation in 1939, most are owned and maintained by federal, state, or local parks, town governments, or non-profit "Friends" groups formed to preserve a specific light. Seek one out. Volunteer today. They need your help. MAINE These photos are of the lighthouse on SEGUIN ISLAND, Maine, and of the island itself as you approach. This 65-acre hump of rock is located about three miles off the mouth of the Kennebec River south of Bath, Maine. There has been a lighthouse there since 1795. The one in the picture, and the duplex residence that served the Keeper and his Assistant Keeper, date from 1857. We were fortunate to live here on the island, tending to many minor maintenance duties, and providing tours and island history to the many visitors, for the entire summer of 2005. The north side of the duplex houses a small museum and gift shop. This is a relatively short lighthouse, but wait til you see the one in Oregon. As you can see in the photos, the top of the island is well over a hundred feet above the water, so the light from this lighthouse is the highest in Maine. 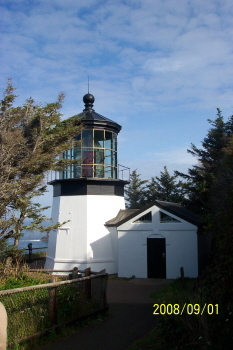 This tower still has the original classic glass prismatic Fresnel lens, seen in the third photo, which is still illuminated with a "fixed" white light. 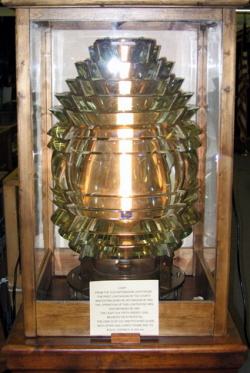 Made by the firm of Henry-Lapaute in Paris, this is the only first-order Fresnel lens still in use north of Virginia. It is an iconic artifact, and to see this lens is well worth the awkward trip to Seguin. Find out more about this lighthouse at:"Seguin Island". 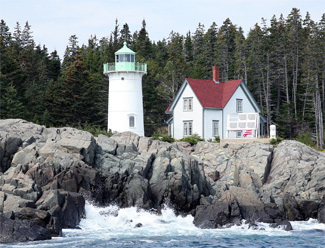 By the way, if I asked which state has the most lighthouses, most folks quickly answer, "Maine." But that is not correct. Maine is number three. Think about it. The answer will be found somewhere below. 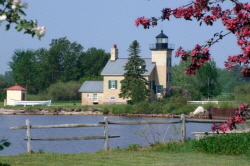 MICHGAN - The three lighthouses pictured above are on the eastern shore of Lake Michigan. All are now maintained and operated for visitation by the Sable Points Lighthouse Keepers Association. On the left is LITTLE SABLE POINT Lighthouse, the one pictured in the sunset shot above. Only the brick tower itself remains from the days when this was a complete "light station", with a Keeper's residence and other support structures. 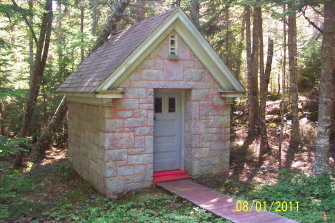 It is located within Silver Lake State Park, just south of Ludington MI. 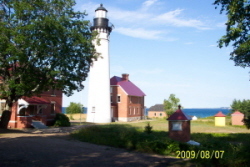 The center picture is of BIG SABLE POINT Lighthouse. It is the same size as Little Sable. They are named not for their size, but for the geographic points on which they are located. Also made of brick, this lighthouse was covered with iron plates when the brick began to deteriorate. 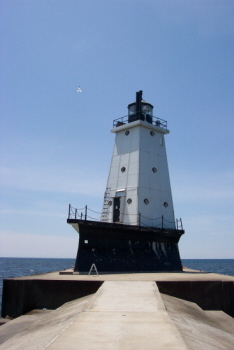 It is located in Ludington State Park. The lighthouse on the right is the LUDINGTON PIER Lighthouse, in the harbor of Ludington. Much more exposed to the violent waves of Lake Michigan storms, this lighthouse is wedge-shaped on the side facing the lake. "Sable Points Lighthouse Keepers Assoc." MOST LIGHTHOUSES - The state that had, and still has the greatest number of lighthouses is - MICHIGAN ! Think about it. Michigan is two peninsulas, surrounded by the waters of three of the Great Lakes, lakes that were and are heavily used by commercial ships. New York is number two by the way. 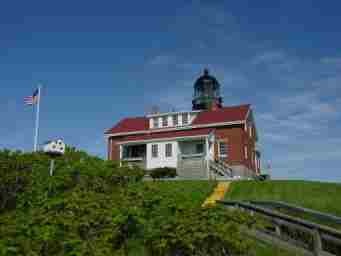 OREGON - The photos above are of the lighthouse at CAPE MEARES, just west of Tillamook,Oregon. Only 38 feet tall from the ground to the top of the round ventilator on the roof, this lighthouse, like many along the Pacific coast, sits on a high ledge and doesn't need to be tall. Its light shines many miles out over the ocean. 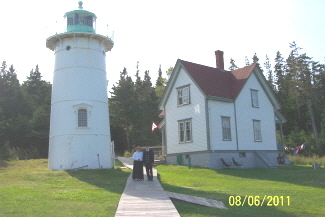 Like many others, it was deactivated by the Coast Guard years ago (a modern light shines from a tall metal tower nearby) and the keeper's house and all the other buildings were removed. The small room attached to the lighthouse is a recreation of the "work room" that was originally there. Today it houses a small gift shop. 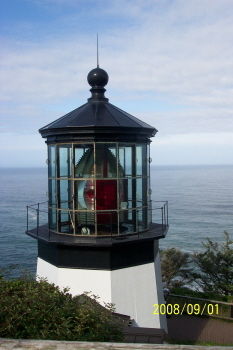 Located within Oregon's Cape Meares State Park, it is operated by the Friends of Cape Meares. "Cape Meares Lighthouse"
In these pictures you also get a good view of one of the fabulous prismatic lenses that allowed a single lightbulb (or oil lamp in earlier days) to be magified into a powerful beam seen for miles. Developed by a French engineer named Augustin Fresnel (Fre-nell), these lenses come in many sizes, and collectively are referred to still by the name "Fresnel", although they were made by several firms in France and England. In all too many cases, these amazing devices were removed from lighthouse towers years ago, replaced by more modern, but no more efficient, light devices. Fortunately many do remain in lighthouses, or in museums where they can be appreciated. This specific lens, also a first-order lens built by the French firm of Henry-Lapaute, sadly is no longer illuminated, and in fact is missing a significant number of its prisms. To add more insult, vandals recently shot the lens several times with rifles, destroying even more of this priceless piece of history. UPPER MICHIGAN - These three photos are of the AU SABLE POINT lighthouse, on the south shore of Lake Superior. It is in the Pictured Rocks National Lakeshore, a unit of the National Park Service. The shot on the left shows a good overview of the entire "light station," the name for not only the lighthouse tower, but the keepers'residences, oil storage houses, privies, sheds, boathouse, fog signal buildings and any other associated structures that supported the light. 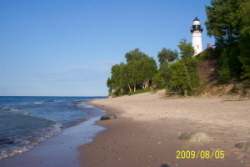 The center photo shows a view of the lighthouse from the Lake Superior beach down below. Since Lake Superior is fresh water, you won't find many "seashells", but you will find a neverending rainbow of stones of all sizes and hues that have been polished and tossed ashore by the waves. The photo on the right is a closer-up view of the "new" (1909) residence built for the head keeper. Summer volunteers live on the second floor; the museum/gift-shop is on the lower floor. Although the tower still retains its classic 3rd Order Fresnel lens, it sadly is no longer illuminated. 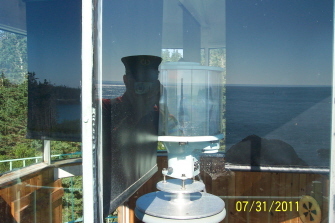 A solar powered modern optic, mounted on the gallery rail, provides a light to mariners on the lake. Check out the park website at: "Pictured Rocks National Lakeshore"
MINNESOTA - This photo is of the SPLIT ROCK lighthouse, on the north shore of Lake Superior in Minnesota. We spent September 2010 as a part of the talented and dedicated interpretive staff there. 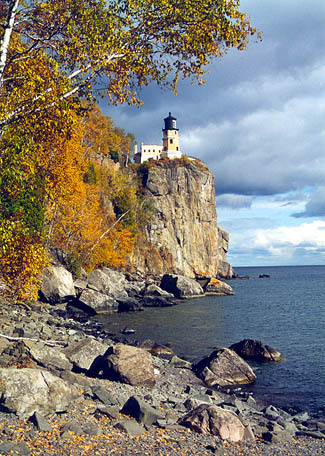 Located in Minnesota's Split Rock Lighthouse State Park, it is operated and maintained by the Minnesota Historical Society. First put into service in 1910, 2010 marked the centennial year and celebration was in order, including a special illumination of the original Fresnel lens (a magnificent "bi-valve" manufactured by Barbier, Benard and Turenne), on the first Friday of each month. A very complete "light station", in addition to the tower itself, the fog signal building, oil house, three keeper residences with their adjacent garage/barns, and remnants of the once extensive tramway still remain. Built on a rock outcrop high above the lake, the tower itself is relatively short. 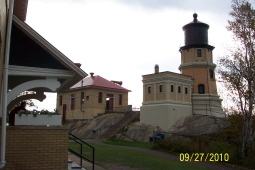 For more on this lighthouse visit: "Minnesota Historical Sites"
The leftmost photo shows some of the structures that make up the Split Rock Light Station. In addition to the tower itself, with attached work room, the adjacent fog signal building and a portion of the head keeper's residence can be seen. The center photo, shows the illuminated lens, as well as the horns that directed the fog signal out over the lake. 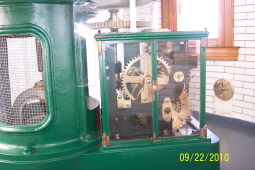 The right photo shows the original mecanical, weight-driven gearbox. Replaced by an electric motor in 1940 when electricity reached the site, the gearbox was miraculously recovered and reinstalled as part of the lighthouse restoration. It is one of the few stations where the original Fresnel lens is being rotated by the original mechanical gearbox. Split Rock's lens revolves on a layer of liquid mercury, one of only a few sites in the U.S. where this system is still in use. THE LIGHT STATION - As noted earlier, the lighthouse "tower" was just one of many structures that was part of the light station. The photos below show some of the more important of these. The leftmost photo is of the oil house at STURGEON POINT on Lake Huron. Prior to electricity, which didn't come to many remote lighthouse sites until the 1950s, kerosene was the fuel of the lamp, and for household use too. It was stored in a fireproof building away from other structures. Prior to kerosene, lard oil was a primary fuel. 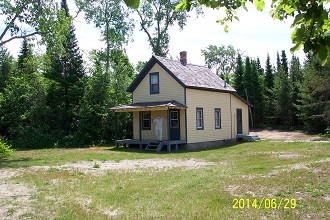 The center photo is of the Fog Signal building at 40 MILE POINT, also on Lake Huron in Michigan. Most major lighthouses had a device to sound a warning when fog obscured the beam of the light. Early on bells were used; then steam-powered whistles. 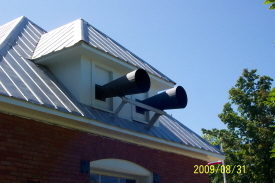 Steam whistles were replaced by air horns, shown here, powered by large air compressors in the building below. Light stations also had one or more boats for the use of the keepers. 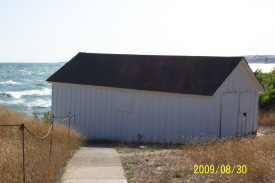 They were pulled up out of the water and kept in boathouses, such as the one shown on the right, located at AU SABLE Light Station. Barns for livestock, sheds, garages, and privies would also have been part of the scene at most sites. BACK TO MAINE - Mid-summer of 2011 found Jack and Tobi back in Maine as lighthouse volunteers. This time it was at LITTLE RIVER LIGHT STATION, located on a small island just off shore at Cutler, Maine. This is way "down East," almost to the New Brunswick border. 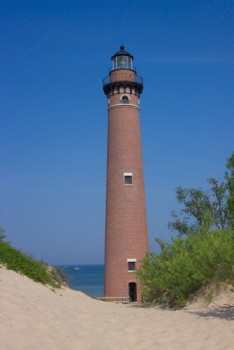 The lighthouse tower is made of cast iron plates and lined with brick. It was built in 1876, when it replaced the original 1847 stone tower on this island. 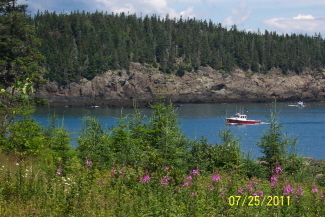 Its purpose then and now was to guide mariners along this shore of the Bay of Fundy as well as into the Cutler harbor. Identical such towers can be found at many other sites in Maine and Massachusetts. 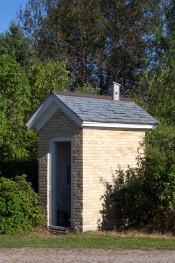 In addition to the tower, this station retains the keeper's residence built in 1888 to replace an earlier stone house. It also has the "new" boathouse, built in 1881 on the other (west) side of the island, and the 1905 Oil House, built of granite blocks from the earlier structures, to store the more flammable kerosene which was by then the fuel used in lamps in both tower and residence. The bell used as a fog signal is now on display in the Cutler town circle, and a solar powered electronic fog horns sounds a warning today. 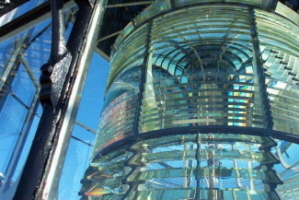 Deactivated by the Coast Guard in 1975, the classic glass-prisms Fresnel lens was removed and lost. 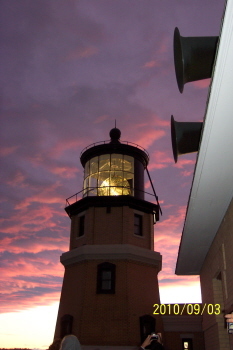 After years of sitting empty, the present more modern optic was placed in the tower lantern room in 2001. A six-sided white Vega prismatic lens, it does much the same job as the classic Fresnel. 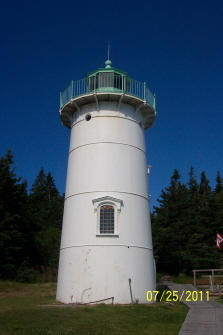 Rotating once around every thirty seconds, it thus sends a white flash of light out to the viewer every five seconds, differentiating it from the Grand Manan light and the Machias Seal Island light, both of which can be seen from Little River Island. 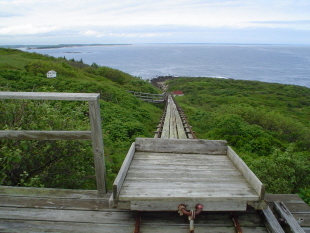 Pictures below show scenes of the Little River light station, including a view from offshore, a closer-up look at the tower, and a view from the tower gallery. Other photos are of the present Vega lens, the oil house, and the boat house. After years of abandonment, the light and the island are owned today by the Friends of Little River Lighthouse, a chapter of the American Lighthouse Foundation. Rooms in the keeper's house are rentable for overnight stay by visitors. Likewise the Friends seek volunteer Keepers/Caretakers. In return for your service for a week or so, you get to stay in the keeper's house too. Remember, you're on an island - boating experience is mandatory. For more information, visit "Little River Lighthouse"
LAKE SUPERIOR ONCE MORE - Late summer of 2012 found Jack and Tobi back on the shores of Lake Superior on Michigan's Upper Peninsula (UP) at the ONTONAGON lighthouse. 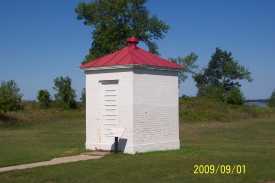 This "cream" brick lighthouse, built as an extension of the matching brick keeper's residence, first went into service in 1867 at the point where the Ontonagon River flows into the lake, replacing an earlier structure. Ships sought the Ontonagon harbor to transport the tons of copper ore, and millions of board feet of white pine and hemlock timber that was brought down the river for decades. 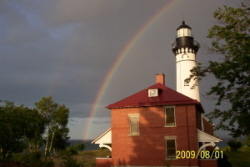 The lighthouse is now owned and operated by the Ontonagon County Historical Society. 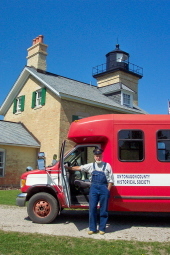 Sadly the Fresnel lens from this tower was removed many years ago, but fortunately has been saved and can be seen at the Society's museum in Ontonagon, from where tours of the light can be arranged, and from where visitors are transported the few miles to the lighthouse in a little red bus, driven by the "Keeper." This light was deactivated in the 1960s, and last occupied regularly in the 1970s. Today the keeper's house has been made into a nice circa-1916 museum. This was the year electricity was first installed in the house. Jack and Tobi were the first to again live in the house in over thirty years, and the Society is considering plans to make it available to other volunteers and/or lighthouse tourists. Other original structures from the "station" that remain are the 1867 brick privy, and the 1901 oil house. MAINE ONCE AGAIN ! Jack and Tobi had the wonderful opportunity to return to not one, but TWO of their favorite Maine lighthouses - Seguin Island and Little River for a time in the summer of 2013. 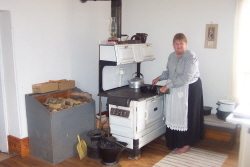 The Friends of Seguin Island, owners/operators of the island and lighthouse, have extended their visitor season into early October, and have offered all their former "caretakers" the opportunity to return for part or all of this extended season. We jumped at the offer and spent most of September on this delightful island. We spent several weeks back at Little River, way "Down East" just prior to our return visit to Seguin. They say you can't go home again, but we found both places as wonderful the second time around as they had been the first. A few more pictures of these great places follow; the top three are on Seguin Island, the lower three on Little River Island, including one of the author heading to shore to pick up visitors. 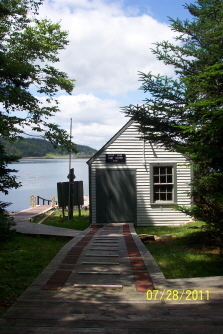 Note the island and the boathouse in the background. STILL ANOTHER GREAT LAKES LIGHTHOUSE - 2014 found Jack and Tobi at yet another of our nation's fantastic maritime treasures, and back on Lake Michigan too, or I should say "in" Lake Michigan. 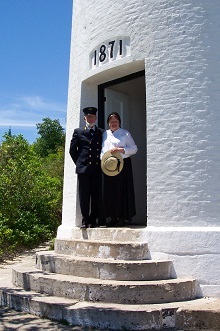 This was the NINTH year in which we have spent some part of the summer as lighthouse keepers /tourguides. 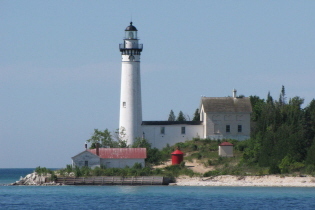 We spent the month of July at SOUTH MANITOU ISLAND LIGHT STATION. As the name implies, this one too is on an island, but that island is sixteen miles off the mainland west of Leland, Michigan. It is a part of the Sleeping Bear Dunes National Lakeshore, a unit of the National Park Service. Visitor access is by private boat (limited moorings)or via the daily commercial ferry from Leland. There are four backpack campgrounds on the island. A few pics follow. The park service provided us with a nice little house to stay in. 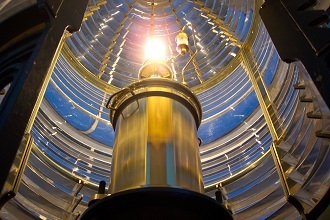 Although the original Fresnel lens has been lost, a fantastic replica is now in the lantern room and focuses its light nightly out over the Manitou Passage. The photos above show an overview of the station, including the building that once housed the fog signals, the round metal and more typical brick "oil houses" and the keeper's residence, built in 1858. [The station's second light tower sat on the roof of the house; the current lighthouse, the third one here, dates from 1871.] The second photo is a close up of the top of the tower, and the third looks up into the illuminated Fresnel lens. The lower row shows the house we lived in, part of the former U.S. Lifesaving Station there, and a shot of "keeper and wife" in the tower doorway. 2015 MAINE ONCE AGAIN - the tenth summer that we have spent some time at a lighthouse - found us back for a THIRD time to Little River Island and the Little River lightouse. Something about an island in Maine that just draws us in. 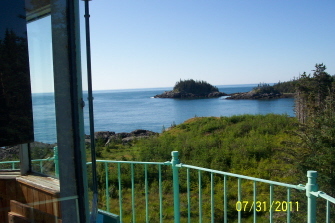 Pictures of this scenic island and the cast iron lighthouse here can be found above. Rooms in the keeper's house are rented for overnight stay by the Friends of Little River Island. MICHIGAN - ONCE AGAIN - Yes, the coast of Maine is lovely, and full of lighthouses, but so are the shores of the Great Lakes, and there too lighthouses abound. You will recall from above that Michigan had and still has more lighthouses than any other state in the U.S.A. The state of Michigan borders on Lake Superior, Lake Huron, and of course Lake Michigan too. 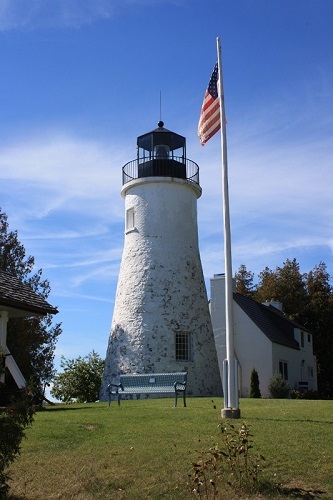 Our destination for June of 2016 is the NEW PRESQUE ISLE lighthouse, at the town of the same name, on the shores of Lake Huron. 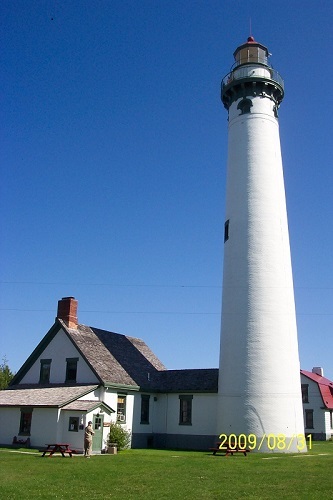 Yes, as the name suggests, there is an OLD PRESQUE ISLE lighthouse too. The two of them are quite close together. The "New" tower, another of the double-wall tapered brick towers, is almost identical in design to the ones at South Manitou, Au Sable, and Big and Little Sable points, all pictured above. 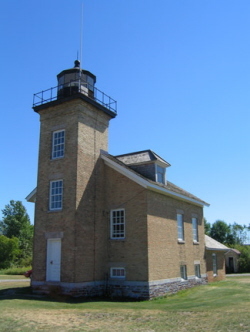 The original "Old" lighthouse on the Presque Isle Point went into service in 1840, but over time it was determined it was not tall enough nor postioned properly for maximum usefulness to the mariners, and so the "new" tower was built. This much taller one went into service in 1871. The pictures below are of the "old" tower (on left) and the "new" tower (on right). KINDS OF LIGHTHOUSES - Many lighthouses are tall brick or stone conical towers, such as the Little Sable tower pictured earlier, and most folks think of this shape when they think of lighthouses. 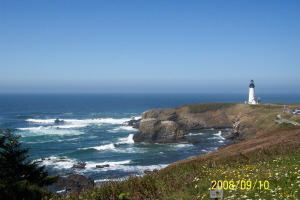 The photo below on the left is yet another of this type - this is the YAQUINA HEAD lighthouse on the Oregon Coast. The middle picture is also a common type - the light is housed in a structure, called the "Lantern", that rises out of the roof of the keeper's house. This one, YAQUINA BAY, is also in Oregon. Another common type is seen in the photo on the right. 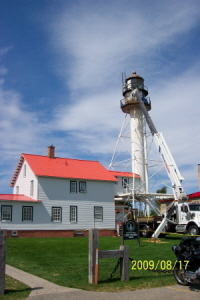 This is the WHITEFISH POINT lighthouse, on Lake Superior, just west of Sault Ste. Marie. There are also lighthouses built completely offshore, on a rock ledge, or a created concrete caisson. Use the "Lighthouse Friends" link at the top of this page to view Minot's Ledge in Massachusetts, or Tillamook Rock in Oregon. Several links to other lighthouse information appear below. This is a section still in progress. JACK AND TOBI NOW OFFER ILLUSTRATED LECTURES ON OUR LIGHTHOUSE JOURNEY. A BIT LIGHTHOUSE HISTORY AND OPERATION AND A BIT TRAVELOG, THIS MAY BE JUST THE EDUCATIONAL AND ENTERTAINING PROGRAM YOUR GROUP HAS BEEN LOOKING FOR. CONTACT US VIA THIS WEBSITE.